Pasta alla Puttanesca. An absolute delight. A good meatballs recipe is a must for every cook’s repertoire. This reipe combines juicy meatballs with a delicious sauce that has an unusual name. 24 meatballs, enough for four people. Spaghetti alla puttanesca (literally "whore's style spaghetti" in Italian) is a spicy, tangy, somewhat salty Italian pasta dish invented in the mid-20th century. The ingredients are typical of Southern Italian cuisine. So there’s the truth of it. How the name originated is the subject of several differing stories—all of which are colourful… but they're too numerous to relate here. Just Google "History of Puttanesca Sauce." You'll find a ton of them. If you've never made them, meatballs aren't difficult at all. If you've ever made your own hamburgers you can do meatballs. They're only a different shape and have a couple more ingredients. Take care to not choose too lean a hamburger. 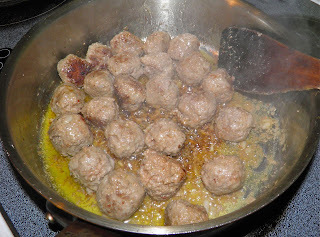 If you do the meatballs end up being dry even though they're cooked in sauce, believe it or not. Rest assured this spicy-salty sauce is a real winner. Promise yourself you'll make it this week. Mash your own garlic and butter together for bread to accompany it . That makes for a wonderful meal for family or friends or both. 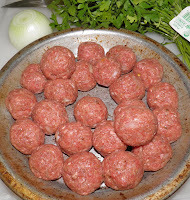 Fry the meatballs until browned but not cooked through. Do not drain the fat. Fry the onion, garlic and olives for a short time. Make the meatballs by combining all the ingredients except for the oil in a dish and kneading well until the mixture starts to look fairly smooth. This should take about 3 minutes with your hand. Wet your hands and roll the meat into 24 equal sized balls. Heat the olive oil in a deep sauté pan and fry the balls until browned on all sides. They do not have to be cooked through. They simmer in the sauce. Once browned remove them to a pan. Add the onions, garlic and chopped olives. Pour in the red wine and scrape the brown bits from the bottom of the pan. Let the olive mixture cook until the wine has evaporated. Simmer the sauce and meatballs together until the sauce reduces. Add the tomatoes, capers, chilli flakes and anchovy sauce. Bring to a boil, reduce heat and let simmer for 5 minutes. 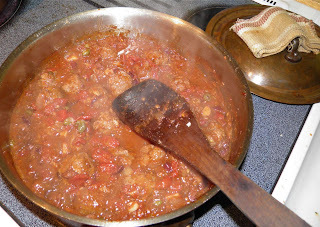 Then add the meatballs to the sauce and let cook until the sauce is reduced, about another 15 minutes. 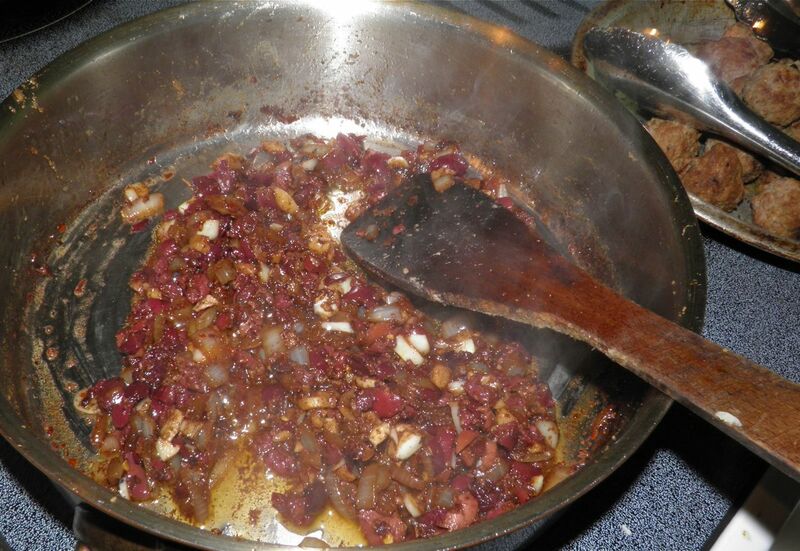 Stir often to prevent the sauce from sticking to the bottom of the pan. While the sauce is simmering cook the pasta according to the package directions. After the pasta is cooked, drain it and set aside temporarily. Turn the heat off under the meatballs and stir in the parsley. 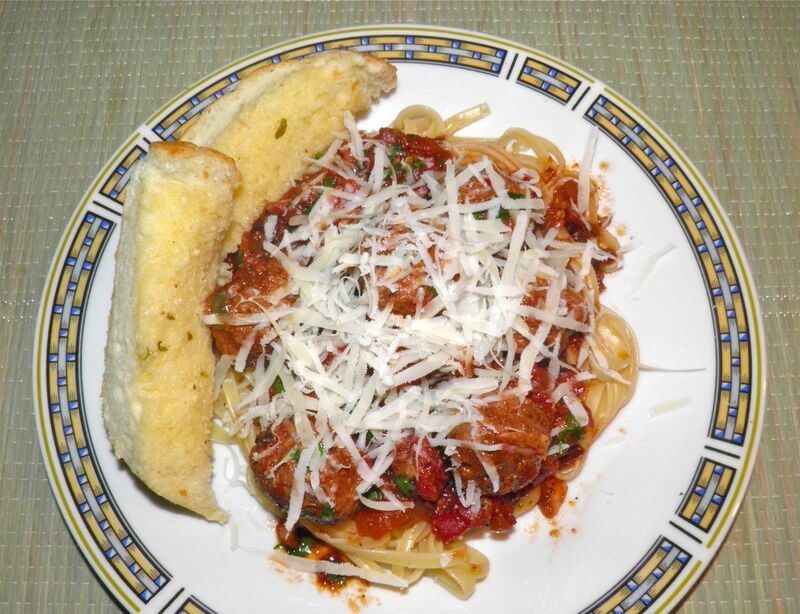 To serve, plate the linguine and arrange six meatballs on top. Grate cheese on top and sprinkle with more pepper if desired. Recipe: Sweet Onion Tapenade, with No Olives! Ingredient of the day: Cardamom, and a Recipe!